At last, I finally got the QRP keyer using KD1JV's Simple Keyer Chip boxed and working. As usual, nothing went according to plan. There must be some relative to Murphy's Law that states for any homebrew project the case will be just too small for comfort. A related rule is the one which guarantees that after you have drilled the case, the position of one of the switches or sockets will be in just the place where it fouls one of the components. After my first attempt at getting it into the box the keyer was dead as a dodo. This turned out to be because I had forgotten to break one of the tracks on the Veroboard. After the second attempt the keyer responded to the function button but there was no keying. That turned out to be because one of the connecting wires had broken at just the point where it was soldered. With my eyes as they currently are that took a while to spot. When I had resoldered the connection and put the board into the case for a third time I noticed that another connecting wire was hanging on by one strand of copper. Lesson: don't use hookup wire from China, it is made from inferior grade copper. This had taken me a day, so I decided to put the project aside until I felt calmer. The next day I re-made all the connections using new wire, put the board into the case one last time and it actually worked! But Murphy had one last laugh: Now I couldn't find the four screws for the Hammond case I was using. We searched everywhere. 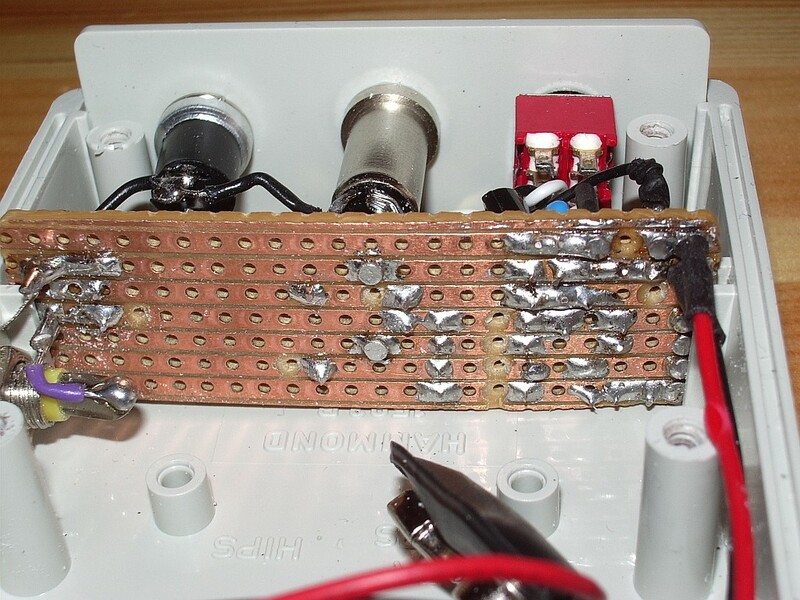 Fortunately my parts box had another Hammond case which sacrificed its screws for the benefit of the keyer. Later, Olga and I managed to find suitable replacements in the local DIY emporium so the other case won't be wasted. 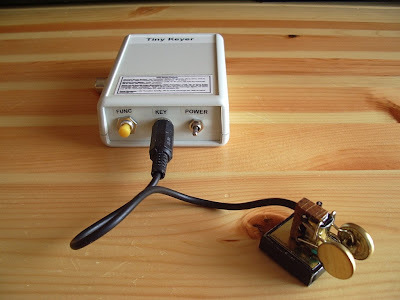 This Simple Keyer is just what I need for the simple QRP rigs that only work with a straight key. The code speed is easily adjustable and there are two memories, one of which can be repeated as a beacon. I don't need more sophistication than that for QRP work. Nice project. I know this paddle. It's still in my /p box. Very nice work Julian, the finished product looks very polished. 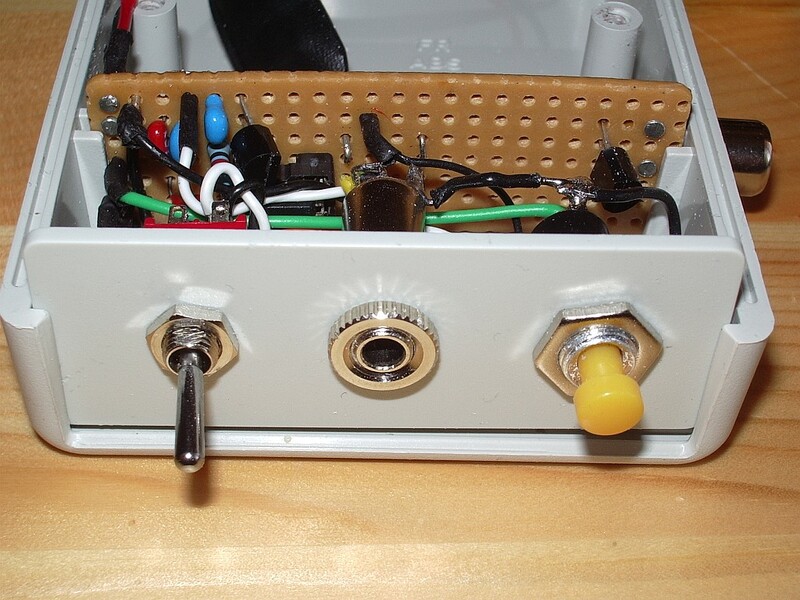 Hi Julian - Where did you get that plastic box with the end panels (for the keyer) from? I'm looking for something similar. It's been in my parts box for a year or so. It's a Hammond case if I remember correctly so I probably got it from Farnell which stocks a lot of Hammond cases.